The fans pick: both equally! Who is the sexiest bad guy in the Potterverse? 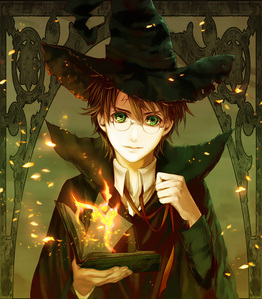 Fantastic beasts and where to find them anime? Did Fred and George ever found out who the Marauders really is? Did they know that Harry was actually Prongs son? Can you guess who the seven people in the banner of this club are? If Draco Malfoy had been raised by a different family, do you think that he would have been a better kind of person? This is like a gold mine of fantabulous fan art! I use a lot of the pictures from this site to win prop contests, and this was also where I found all if not most of the harry potter pictures I posted on this site. I was a little disappointed reading this because the art form in Dragon Ball Z is one of my least favorite. Now I don't want them to make Harry look like a pretty boy, but I wouldn't mind looking at a black haired, green eyed Zero. You know what /else/ would be a good idea? a poll was added: Who is smarter? a comment was made to the poll: Who is the most cruel, atrocious, brutal, brutish, callous, cold-blooded...etc Death Eater? a poll was added: Fantastic beasts and where to find them anime?